This past Saturday, I was able to finally quilt up the top I’ve been calling ‘Charmed, I’m Sure’. 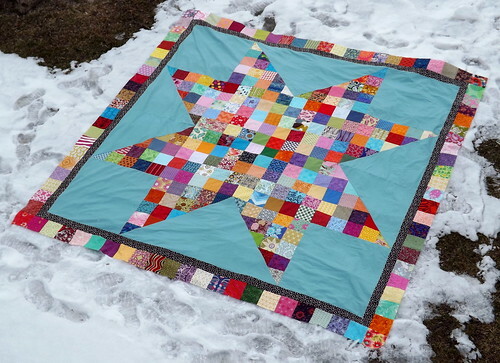 This particular quilt top has been waiting for its turn to be completed since March 23, 2013. *facepalm* Yup, I’ve some ancient quilt tops in my pile. I’ve spent the week since alternating working on stitching the binding on, or sleeping underneath the thing. 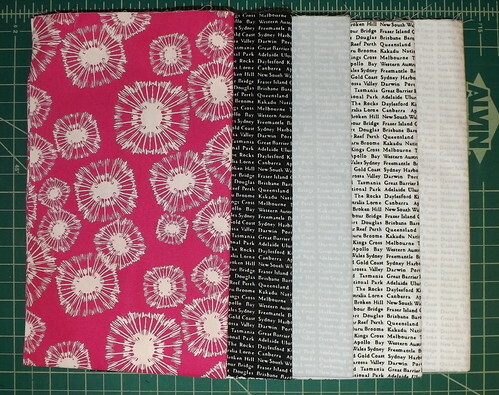 This morning, I put the last stitches into the binding – which used up half a yard of one of the oldest prints in my stash! I then took my husband and the new quilt out for a photo shoot. I hate taking pictures of my work in the winter – today’s shoot involved some mishaps due to the light, and a slide down a hill on his stomach for my husband. Unfortunately, I wasn’t at the ready with my camera, so I didn’t get any footage for posterity. 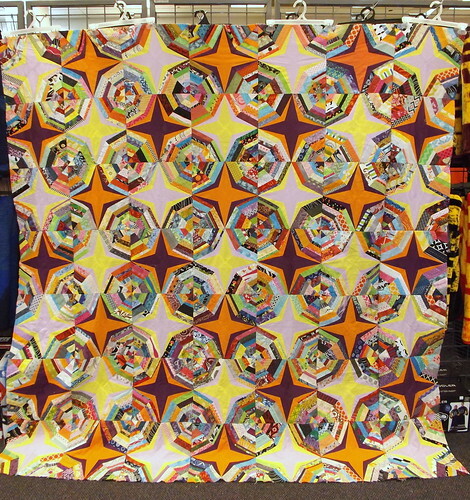 This quilt is HUGE at 99.5″ X 99.5″ which is why it waited so long. I couldn’t imagine trying to shove that beast through my domestic machine. The backing was another of my make-do affairs. 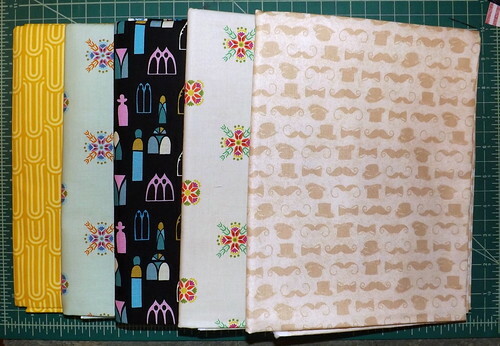 I very rarely buy enough of a single fabric for backing, unless I get it at an amazing price. 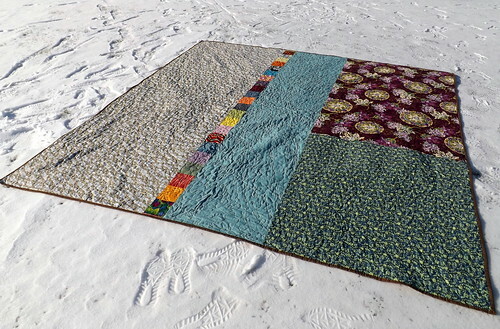 For this particular quilt, I decided to use up the rest of the hospital scrub green solid that I used in the quilt top, two ‘ugly’ fabrics that I wasn’t going to use anywhere else, and a feather print that I’d purchased for another project. I ended up needing just a few more inches for this backing to work, so I inserted a strip of charm squares to make up the difference. It’s so good to have this one off my WIP list, even though it didn’t help me much with my stash usage… I’d had the backing prepped for ages, so it very definitely pre-dates my stash resolution for 2016. Linking up to Finish It Up Friday and Can I Get a Whoop Whoop? since it’s the end of the week. 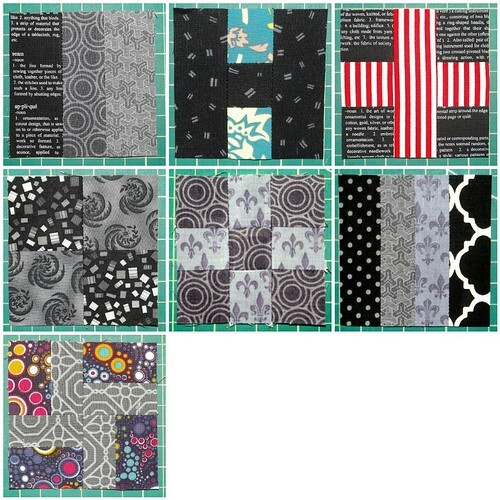 Yes, there is a 365 Challenge Quilt Sampler out there, and yes, I’m doing it! Of course I am. It’s a quilt-along – we’ve already established that I’m a sucker for a quilt-along. Blocks are being posted daily – one block for every day of the calendar year. 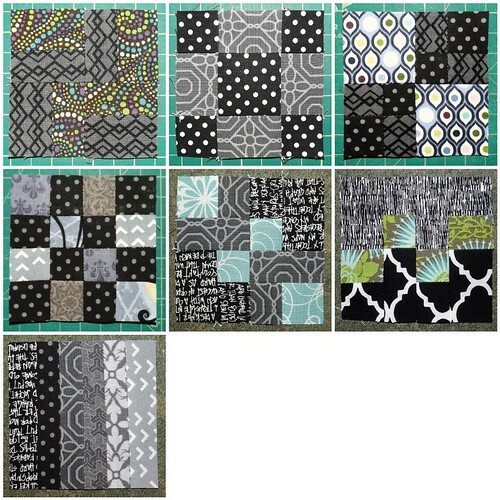 Blocks are mostly 3″ and 6″ finished, but there will be a few other sizes mixed in. 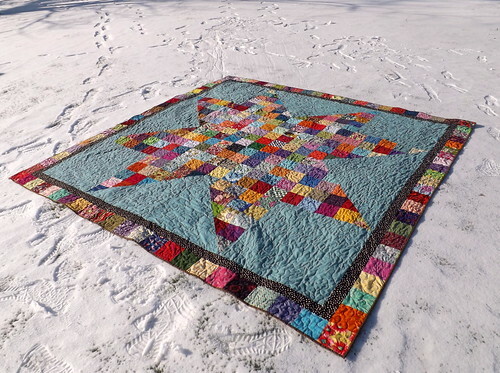 Also, come April, there will be instructions to complete borders, so none of the participants will have to wrangle 365 separate blocks at the end of the year. It’s a good reason for me to take a few minutes and sit at my sewing machine every day. So far, that few minutes has been just enough to spark me to sewing on other projects. I’ve already determined that I’m going to work from my scraps and stash for this top. I’ve started with my greys and blacks, but I’m throwing pops of color in as I feel like it. So far, I like the look. 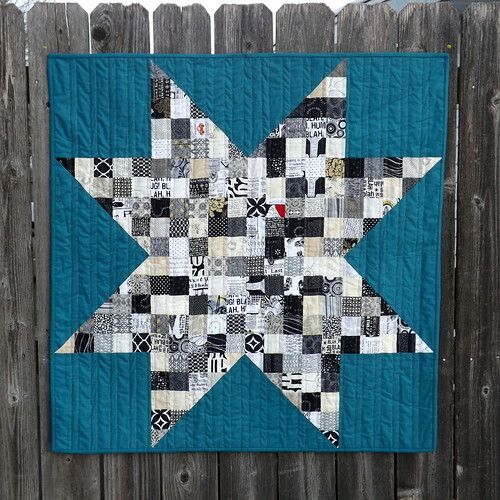 Rather than inundate the blog with a daily post about each 365 Challenge Quilt block, I’m going to do a weekly round up, of that week’s blocks. As of writing this, nine blocks are available, and I’ve nine completed. Seven days, seven blocks. They’ve been simple blocks so far. My understanding is that difficulty will increase as we progress through the year. It’s been fun, revisiting my scraps for these blocks, and more fun to use scraps leftover from the scraps to piece later blocks. Doing this, of course, means that I’ll probably play with the final layout, to spread out the random pops of color, when it comes time to start assembling, but I’m okay with that. I’m just going to enjoy the journey. 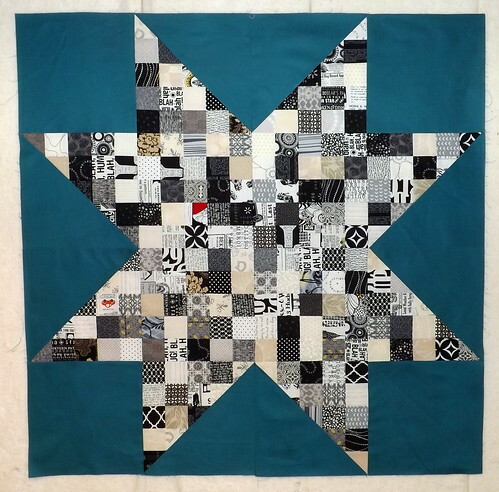 Since A Lovely Year of Finishes is now retired, I decided to follow along with Red Letter Quilts One Monthly Goal. While I’ll still be doing the 2016 Finish Along, I like the idea of having a monthly goal. I can set smaller milestones for myself. I’ve got all of the large diamonds cut, strips for the small four-patch diamonds prepped, and all of my fabric has arrived. This means that I will have more starching and pressing to do, but the starching is totally necessary for this particular quilt top. 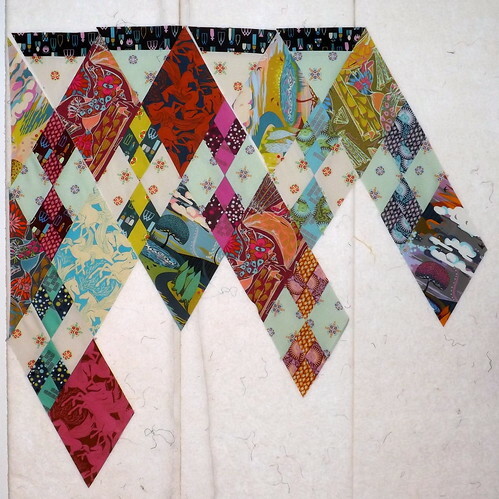 I may be able to make quite a bit of progress on this quilt top tomorrow – it’s my monthly group sewing day. 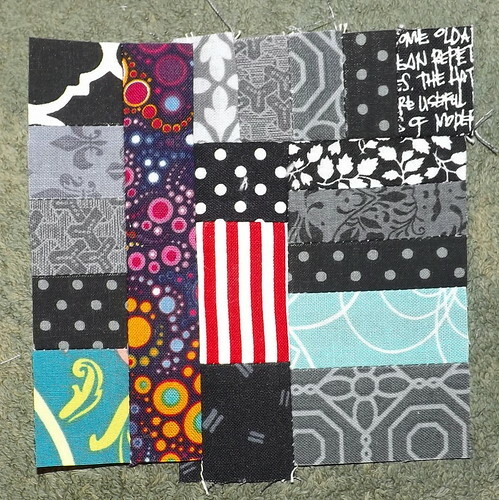 It’s just a matter of what I work on… I’m hoping I might be able to quilt a top up. We’ll see what happens. Regardless, progress photos soon.